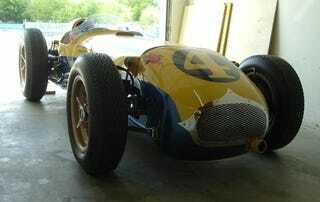 Reader Jeff emailed us yesterday after our post about the very cool collection of the starting grid of the 1952 Indianapolis 500. As a paid "can you hear me now" guy, he roamed huge swaths of North Texas and one day managed to see the tail end of this beauty poking out the back of a garage. Despite our laziest best efforts to figure out the history on the car, we couldn't find anything on this particular Federal Engineering car. More pictures, and Jeff's story about it below. I used to have a job like Murilee mentioned he had. I drove literally every street and cul-de-sac in the northern half of the Dallas/Ft. Worth metroplex for a place called "Skyhook Wireless" for WiFi mapping. Being a paid "wardriver" is great! I had a chance to take pictures of interesting cars I saw along the way. One day, I passed by an shop and saw a race car sticking out, so I stopped and asked permission to take some shots. He told me that it was a former Indy car, and that a driver was actually killed in the car during a race (not the 500 however). He couldn't remember the details of the car, however. I was hoping you might recognize it. Well, we don't recognize it, but somebody might. The most fascinating part about these pictures is the parts you don't often see. Looking at the drivers cockpit, you get an idea of the stone these guys must have dragged around. We also think modern designers should take notes from this car, imagine hopping into a car and being greeted by a row of toggle switches and a spoked steering wheel — and that's about it. Awesome.